Can anyone please help me with some advice on how to approach this problem. This design editor also features some css design and is basically a standalone webpage. I truing to load my main.js on home and cart page only , currenlty it is loading on all pages , can any one knows how to load on specify pages in custom module . I want to include paypal plus external js in magento2, it already contains jquery library which conflicts with magento jquery. How do i load it ? 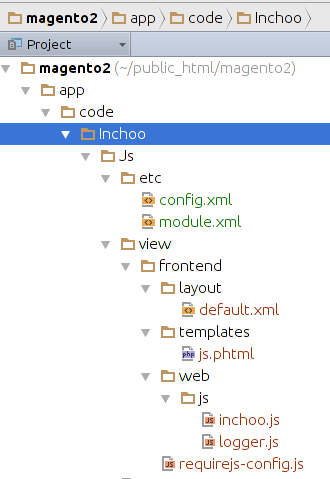 What I have to input in Inchoo/Js/view/frontend/layout/default.xml? How are you loading the js.phtml? What little magic piece am I missing? YES, what goes in the default.xml? Obviously not a block because you didn’t include any block classes. Doesn’t requirejs-config.js have to go in /frontend and not frontend/web to get it to actually load? I have a question about prototype.js. Is it there in magento 2? two slashes before CDATA are causing this error. Did you solve this issue? I have the same problem. Got this solved by removing comments. Thanks for this info, would think that a lot of people would help this.